NEW ZEALAND’S Mark Purdon and Natalie Rasmussen took a major step towards claiming a slice of Inter Dominion history at Tabcorp Park Melton tonight. Brian Hancock won with Our Sir Vancelot in 1997, ’98 and ’99, followed by Rasmussen with Blacks A Fake which was too good in 2006, ‘07 and ‘08. As it stands, Purdon and Rasmussen are just the second trainers to win consecutive Inter Dominions with separate horses since the series’ inception in 1936. The pair were successful with Smolda in 2016 and Lazarus in 2017 when the Finals were conducted in Perth. The late Bob Knight was the ground breaker, scoring with Our Maestro in 1988 and Jodie’s Babe in ‘89 . As for their latest assault on the time honoured series, Purdon and Rasmussen annexed two of the three heats with their only two runners! Rising star Spankem upstaged his more fancied rivals when he produced a strong performance to secure the opening qualifier with Rasmussen in the cart. Settled midfield from barrier five, Spankem was sent forward to test the leader, My Alpha Rock, from the ‘death seat’. Forging his way to the front at the top of the home straight, the son of Bettors Delight scored by three-and-a-half metres from Pats Delight, with Tiger Tara a head away third. 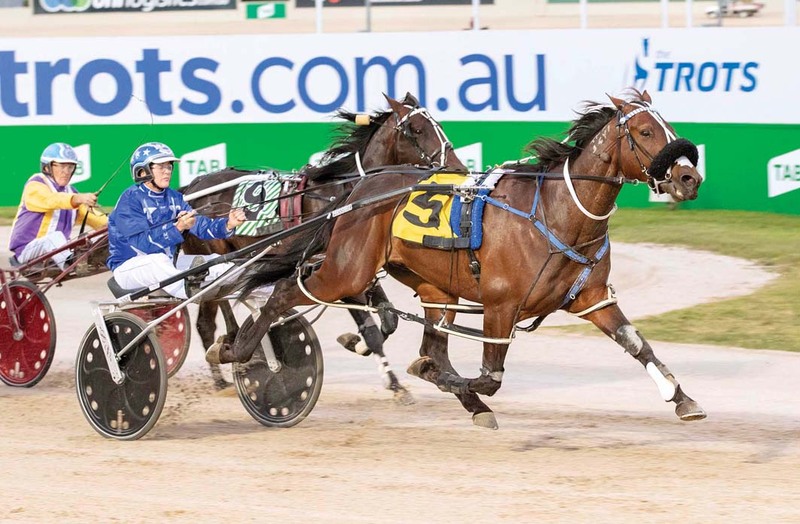 Rating 1:54.3 over 2240 metres, the four-year-old is believed to be the lightest-assessed Inter Dominion heat winner as a C1! “He did a great job,” Rasmussen said. “He’s still a chubby little thing so the run will do him good. Rasmussen then completed the double after Cruz Bromac worked to the lead from barrier four before accounting for Chash N Flow and Maximan in 1:53.8 to be the fastest heat winner of the night.